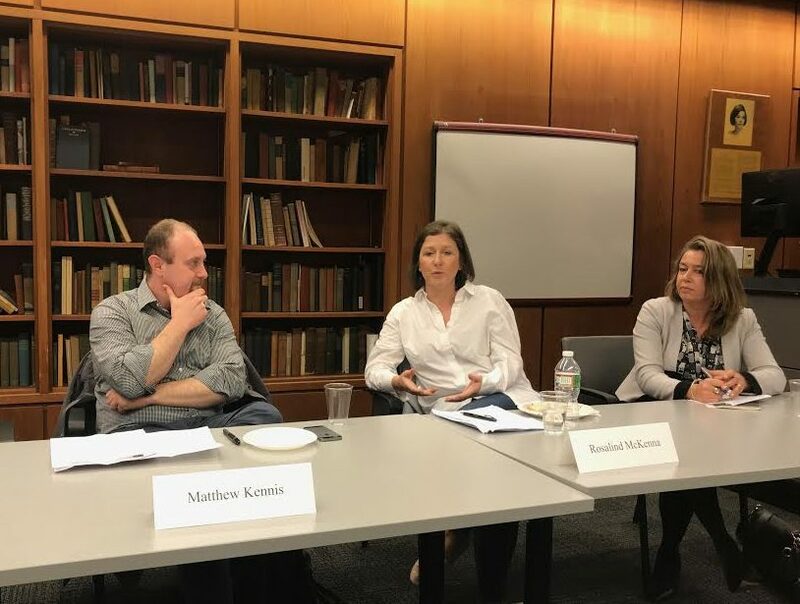 The Institute for the Study of Human Rights held its annual human rights career panel last month, offering students the chance to hear from individuals in a variety of human rights careers. 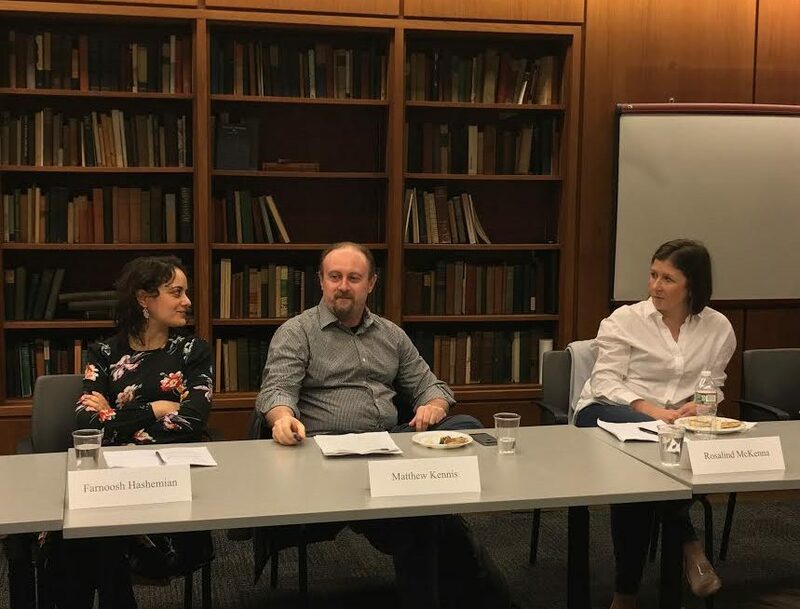 The panel was an opportunity for future practitioners to gain insight into human rights in action outside of academic study at Columbia University. 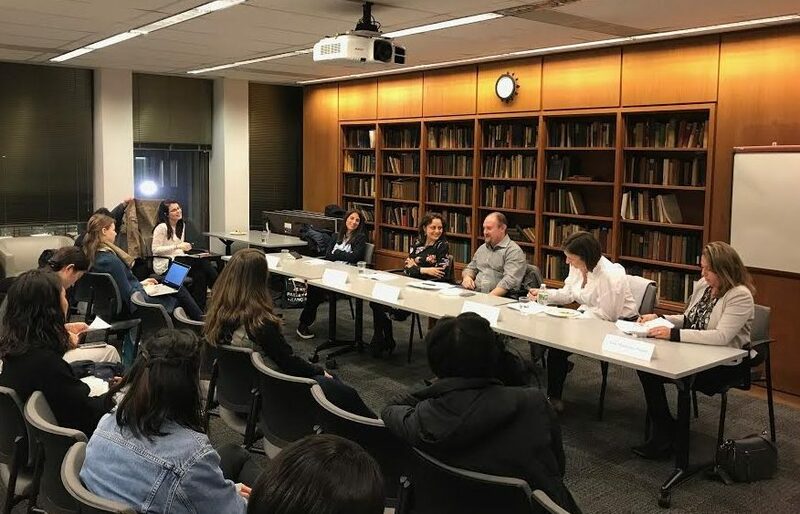 The undergraduate and graduate students who attended the event held at Columbia’s International Affairs Building posed questions about their professional futures in human rights. The panelists, all career veterans in the field, helped answer student concerns by sharing stories about their career paths, their experiences, and other practical advice. What are the most rewarding parts of a career in human rights, and what are the challenges? The panelists agreed that the human rights field can be complicated and frustrating at times. Victories don’t always happen, but it is important to be happy with the measurable successes that do occur. Sofia Coelho Candeias, a member of the UN Team of Experts on Sexual Violence and Rule of Law, said that accumulative successes are a huge source of pride over time: the results you want may not happen immediately, she said, but in retrospect successes do occur. In the DRC, where she works currently, for example, they went from zero police units for sexual violence in 2008 to 12 today. Whether on a policy or field level, it is very rare to have the opportunity to make a real difference in any job, said Aida Martirous-Nejad, the special assistant to the Assistant Secretary-General for Human Rights at the Office of the High Commissioner for Human Rights in New York. “What job would I rather do?” she asked, speaking to the unique ability of a human rights career to impact real change through action, policy and community-building. Rosalind McKenna, who works for the Open Society Foundation’s public health program chimed in to say how rewarding it is to support individuals so that they can may make their own voices and challenges heard. Yes, there’s a lot of bureaucracy in larger organizations, added Farnoosh Hashemian, a human rights lawyer in Iran. But you spend your time connecting with like-minded human rights defenders, all of whom are incredible people dedicated to their jobs, she said. Coelho concurred, saying that people who do public service tend to really like their job. Otherwise, they would all have to quit, she said. What skills do I need in order to have a career in human rights? What are employers looking for? Every human rights career is different, but there are definitely skills that come in handy, the panelists agreed. Every single person in the human rights field is there because they care deeply about human rights issues and are willing to “fight the uphill battle,” said Matthew Kennis, the program director of the Libertas Center, an organization located in New York City that provides medical, emotional and structural support to victims of torture. Kennis talked about what he would look for in a prospective applicant. He currently leads staffing for the Libertas Center. Important to him is the ability of the candidate to learn quickly. The candidate must have a genuine narrative of why they actually want to be there: how will they connect their interests to their career goals? Build yourself as a whole person, Kennis suggested. Trust the path that your career takes. Coelho mentioned the importance of fieldwork, especially for young advocates just starting their careers. Each member of the panel spent a significant amount of time on their career journey doing fieldwork. Coelho also pinpointed kindness to others as the most important character trait needed in human rights jobs. Being open to listening to others is the only way you will survive in this field— you will get so much more done when you are kind to people, she said. Martirious-Nejad also stressed optimism. In human rights work, you will be told “No!” nine times out of 10, she said, but you can’t be a pessimist in this work. You have to be able to adapt and move forward despite challenges. Hashemian spoke of the fact that getting jobs in the field is highly competitive, but she encouraged students to persevere. All panelists agreed that networking is essential to success, along with development of interpersonal communication skills. Human rights is a team effort, and you’ve got to be a team player, said Hashemian. Humble, too, added Coelho. McKenna recommended taking the time to have a cohesive, polished CV and working on your ability to sell yourself as a person, not just as a list of achievements on paper. Other technical skills the panelists recommended include knowing at least two if not three or four languages. “Take immersion courses!” said Coelho. Do I have to go to law school? McKenna, Coelho, Martirous-Nejad, and Hashemian all have law degrees. Broadly speaking, they said, law school is probably a good idea, even if you do not become a practicing attorney. The critical thinking skills alone are worth learning. Martirous-Nejad mentioned that because she is a lawyer, she has had more access to jobs than her peers who are not attorneys. The decision, however, is up to the individual student. Law school is costly. Perhaps do some fieldwork first, said Coelho, before committing to that investment. You keep talking about the field. What is it? Fieldwork is an integral part of a lot of human rights work, the panel said. Fieldwork can take place domestically or internationally, although often international work is the most common. You can look for jobs with larger organizations such as Amnesty International or the UN, says Hashemian, but you can also contact smaller local nonprofits in the location where you want to work. Regarding the question of where to go based on geography or issue area, Coelho said, “What you want to do defines the field.” Sometimes, she said, issue areas are more important than a certain location. McKenna recommended that individuals looking for fieldwork check out the database of the Open Society Foundation (OSF), which has a list of the non-profits that OSF has funded. Fieldwork will teach you to be humble and follow a leader, said Kennis. It is your chance to interact with those you’re helping directly on the ground, added Coelho. Yes, some places can be dangerous, as Hashemian pointed out, but you will receive security training and are often well cared for, especially when you focus on building strong relationships with the locals. At the conclusion of the career panel event, students were offered some time to network with the panelists. It was clear that the panelists are enthusiastic and passionate about the work they do in the human rights field. The panel represented an invaluable opportunity for students to get a taste for what a future in human rights might be like. For more professional development and career advice, check out ISHR’s website. Sofia Coelho Candeias is a member of the UN Team of Experts on Sexual Violence and Rule of Law. In this position, she focuses on sexual violence prevention and accountability in the DRC, CAR, Mali, Nigeria and Iraq. Her job frequently entails flying from the UN headquarters in New York to the various countries where she covers and surveys the status of sexual violence. She has spent significant time in the field, holding positions such as senior associate and criminal justice coordinator at the International Center for Transitional Justice, project manager of UNDP’s Women’s Access to Justice in the Eastern DRC, and coordinator of the Sexual Violence Unit of the European Union in the DRC. 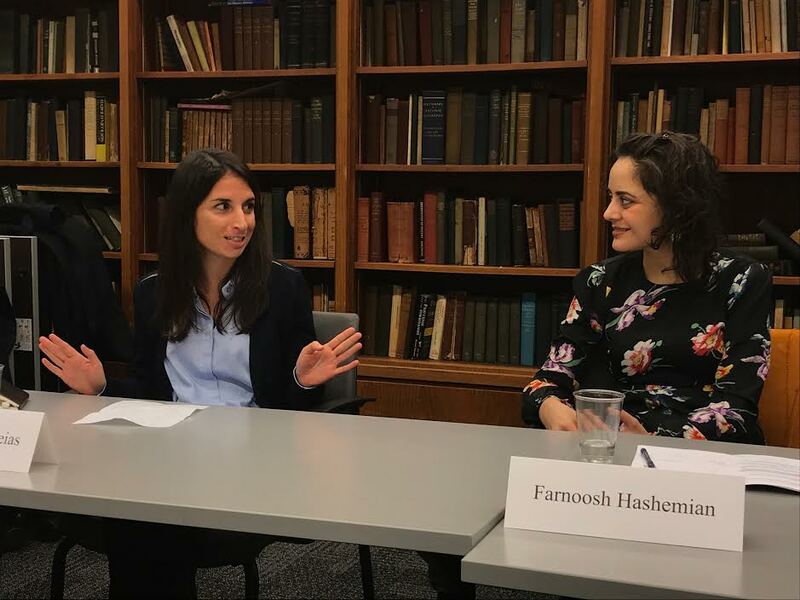 Farnoosh Hashemian is a human rights lawyer who focuses on national security and human rights, constitutional reform, access to justice, and women’s rights. Also an author, she has written the book, “The Trial and Diary of Abbass Amir Entezam, the Longest-Held Prisoner of Conscience in the Middle East.” Growing up in Iran, Hashemian was an activist from a young age, always inclined toward justice and human rights. Currently, she works in Iran supporting various advocacy organizations and provides technical support to organizations in Afghanistan. 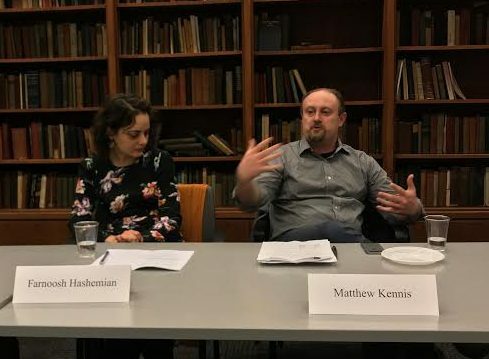 Matthew Kennis is the program director of the Libertas Center, located in New York City. He is also a graduate of the ISHR’s Master of Arts in Human Rights Studies program. The Libertas Center provides medical, emotional and structural support for victims of torture who are rehabilitating back into society. As director, Kennis hires people and supports and runs the Libertas advocacy work. Rosalind McKenna works for the the Open Society Public Health Program within the Open Society Foundation (OSF), a philanthropic organization that supports governance for health, health rights and law. OSF funds health projects overseas. McKennna helps to find individuals, non-profits, and NGOs to whom OSF can provide funds. She has also worked as the coordinator for Amnesty International Ireland’s program on economic, social and cultural rights. Aida Martirous-Nejad works as the special assistant to the Assistant Secretary-General for Human Rights at the Office of the High Commissioner for Human Rights in New York. Much of her work takes place at the UN Headquarters where she covers Europe as a desk officer. Part of her job includes working toward integrating human rights language into codified national and international policy. Rowena Kosher is an undergraduate student at Columbia University School of General Studies. She plans to major in human rights with a possible focus on gender and sexuality studies. Her writing can be found on her personal blog, fromvermiliontoviolet.wordpress.com, and at elephantjournal.com, where she is an occasional contributor. Rowena is a blog writer for RightsViews.